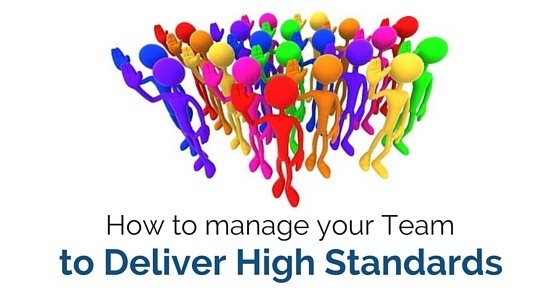 How to Manage your Team to Deliver High Standards? In any organization, team work is an important way by which projects are completed and also assist in developing and fine-tuning skills. By this way you can make a good contribution to your team. When a high growth business is being run, it is mandatory to deliver high standard output. Though the business has an enormous growth, stress and tension, quality output is vital. Delivering effective as well as valuable customers is mandatory in business for the development and survival. With all this in mind managing team to deliver high standard is necessary. The quality of service is the main aspect through which loyalty of the customer is received. For organizations to develop and maintain a competitive advantage, a clear strategy is to be possessed. By this way the customers demand and expectations are met. The team therefore should be fixed with a clear strategy in order to deliver high standard. When there is a regular contact with the customer, loyalty and trust will be developed. The customers are also satisfied with your open communication and they value the relationship with you and hence communication with the clients is necessary. When customer needs are satisfied and service constantly improves it is a sign of high standard delivery. Make sure your team does great work no matter whatever happens. The team should make sure that they do not fail with surrounding as an excuse. Though there are opportunities to fix and mend any hassles, a lot can be done to fix and shield the team. A good management can help you produce solid results. A good manager can get the team to perform well and offer high standards. There may be a number of tools that can be used to fix a problem. The team and manager should make sure to fix problems when they are small rather than waiting for a crisis to occur. It takes up more of time when the issue has become difficult. By fixing such issues the team can deliver high standards. The process of planning is very important and stands to be a way to measure the output. The result includes a number of factors such as deadline, results and so on. The work must also be planned as executed as expected by the customers. Planning process helps manage your team to deliver high standards. Managing time is an important factor that needs to be achieved and considered as an investment. Meetings as well as other activities should be managed with the help of time. The team should make sure to budget time and work as per it to deliver high standards. Planning where the problem is clearly defined, collecting evidence, identification of impact, measurement of problem, and effectiveness is achieved. In the next doing phase, possible causes are generated, need fixing causes are identified and worked on and experimental text or writing plan is achieved. In the check phase, action plan and experimental test plan is carried out. In the act phase implementation plan is carried out. The team should make sure to use their strength as each individual. The strength of each team member is something which can be a great contribution as a team effort and deliver high standard output. The contribution is something meaningful and chances of achieving a job are grateful. Apart from handling varied technical issues, the team works for varied roles to deliver a high standard. To deliver high standard in a team, Belbin introduces many team roles where nine of them are mentioned for the team’s success. The team has shapers who to challenge the team to improve. Implementers in a team are ones who are able to get things done. To check if projects are completed at time complete finishers are available. The team leader role is taking up as a coordinator. Team workers are meant to work together. Plants are ones who come up with new ideas and outcomes. Specialists in a team are ones who are able to get things done in a team. The Belbin model is utilized in a team to make sure they are able to balance strength and weakness in a team and can deliver high standards. When teams are not able to function well the main drawback is that they lack understanding objectives. Communication and understanding about the team objective is important in order to help the team perform well and deliver standard output. They should understand the reason why they work, the deadline they require to work and complete the project, and they should also picture the outcome of the project. When any member of the team or organization says something and executes something else, the group’s progress is slowed down. Each member should be a valuable asset to the team where they should be able to do something which they promise. When a team member does what he promises it may be impressive. Being reliable is something you do for your group. When your team has high standards then the team will show excellence in work and quality standard. To achieve best outcomes, every member of the team should be active and communicative. The team members along with the leader should support one another by challenging their thinking. They should also remember to stay positive and respectful in order to deliver high standards. In a team there are number of things which can change immediately, in that manner goals may be altered, budgets can be diminished and lot more can change. The best team players are ones who know how to be flexible within the team at time of changes. When there is change in a team they don’t fight for it rather than they see it as an opportunity to grow. When a team is flexible they have the chance to take up more opportunities that arise at time of project. The team should possess the capability to remain comfortable at times of change in parameters in the team. This is an important business skill, by being flexible to all changes the team will be able to deliver high standard. The team members should be cooperative and willing to work without any hassles. They should be able to help others and also solve issues together in order to complete the task. Involvement and enthusiasm within the team is another parameter to complete the task. By this way they will be able to deliver high standard. The team members should plan and segregate the project work so that they are able to work on it and submit before deadline. The tools and resources can be made use of in the right manner so that each task is completed by time and the project is completed all together. The team should be able to deliver project at stipulated time with quality standard. To deliver high standard output in a team few factors are to be monitored. The eight factors mentioned are team work functions which include advising, innovating, promoting, developing, organizing, producing, inspecting, and maintaining. When all these parameters are followed in a team, it is sure to deliver a high standard output. The team leader should make sure that all these aspects are monitored and evaluated. Working as a team is never an easy job, teams are developed to deliver quality output and solve issues that arise. They should have the capability to deliver high standard output though they have strict deadlines and tight budgets. All these constraints are an opportunity for the team to rise and shine. Performing as a team is not only great task but also an opportunity to shine. Identifying the necessary aspects which is required for the team is one main aspect that can help the team deliver high standard. The teams should identify their strengths and understand their roles. They should be in a position where they are flexible and reliable until the project is completed. Each team member should stay positive and help others in all aspects. Cooperation and willingness to work are some aspects that make the team strong and deliver quality output. These few pointers are mandatory for a team to deliver high standard in spite of any hassles that might rise. Previous articleHow to Tell an Employee, they need to Improve?